Book your Turks and Caicos vacation and you will be blown away from what this Caribbean destination has in store. World-class hotels, exquisite spas, fine restaurants, long stretches of uncrowded beaches and beautiful coral reefs, and the most stunning scenery and nature, this all awaits you in Turks and Caicos. Engage in your favourite water sports, soak up the sun on a quiet beach or spend your vacation actively and join one of the many tours and excursions offered. We know, once you land here, you will be swamped with hospitality, unique serenity and the natural beauty of the islands that will take up a place in your heart forever. Why Choose Turks and Caicos vacation? Words cannot describe how stunning and inviting the islands of Turks and Caicos are and if you are still thinking about a good spot to have your vacation, these Turks and Caicos have it all. Excellent weather throughout the year, the best snorkeling and the finest diving sites. They are pretty close to the shores of the United States making it an easy-to-get-to destination. Providenciales is the busiest and most developed out of all the islands in Turks and Caicos, where crowds of tourists arrive daily, but other islands that are more quieter such as Grand Turk, North Caicos, Middle Caicos, South Caicos and Salt Cay offer the never-ending beauty of untouched nature with swaying palm trees and tranquil oasis. Diving, cruises and boat tours, parasailing, horseback riding on the whitest, warmest and most enticing sand on earth, visiting the Salt Cay - one of the smaller islands, Chalk Sound National Park in Providenciales, a natural, gorgeous blue water lagoon with many small islands with vegetation, or taking scuba diving classes to dive along the great Wall located just off the shore of the Governor's Beach is only a small chunk of activities that will keep you busy during your Turks and Caicos vacation. For a more relaxing and less active time visit one of the fascinating beaches - SunRay Beach and Pillory Beach, here you can without a doubt snorkel in the most clearest and calmest waters, enjoy the white-sand beach or play some beach games. Who wouldn't want to visit Turks and Caicos and experience the beauty this luxury Caribbean spot offers?! If you are not on a strict budget you can enjoy the islands any time of the year. The weather stays hot throughout all the seasons at 23-32 degrees Celsius (73-89 degrees Fahrenheit), the humidity level is low due to the cool trade winds, the islands activities are in abundance and the only thing that's missing is you. However, there are a few things to keep in mind before booking your Turks and Caicos vacation. During the off-season, a lot of hotels and resorts lower down their prices, giving as much as 40% discount on all of their accommodations. This is a great deal but only runs from end of April to the beginning of November and on specific hotels and resorts, so be sure to check your selected accommodation's prices prior to buying your package. Some hotels close down in September and October for renovations and employee vacations, so be sure to double check that as well. April and May would be the best times to go on Turks and Caicos vacation as the weather is pleasantly warm, the majority of tourists has left to go home and the prices drop down substantially. This is a great time for a budget traveller to enjoy the tropical ambiance of the island with deserted beaches, brilliantly coloured coral reefs and the exclusive upscale resorts at a fraction of the cost. 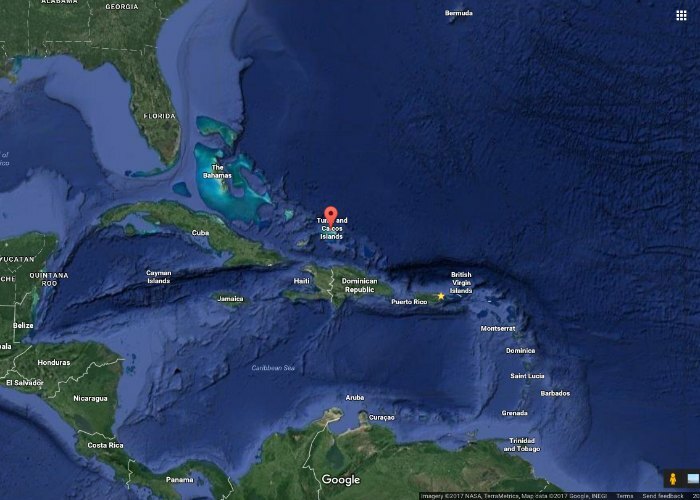 Where are Turks and Caicos on the map? Turks and Caicos, A British Overseas Territory, is located 681 km (423 miles) southeast of the Bahamas, 370 km (229 miles) northwest of Dominican Republic and 618 km (384 miles) east of Cuba. This archipelago of 40 islands, where only 8 are inhabited makes this a fabulous destination. Cockburn Town is the capital city and the seat of Turks and Caicos government. It is located on the island of Grand Turk and is considered the oldest town in the country that has the character of all the local settlements. 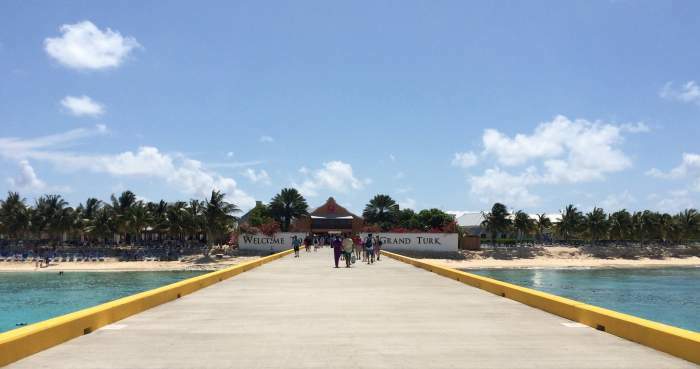 Approximately 4,000 residents make Grand Turk their home. Grand Turk is a tiny island, with not that many roads, so it's hard to get lost even if you are a newcomer. Although Cockburn Town's history is not as extensive, there are still a few very interesting historical landmarks to see during Turks and Caicos vacation. All the sightseeings are stretched along 1.6 km (1 mile) of coastline with a majority of things to see on Duke Street, Queen Street and Front Street, that run parallel to the beach. Cockburn Town Lighthouse, Turks and Caicos National Museum and a Cockburn Town Beach are just a few things that need to be checked out. Grand Turk, a quiet island, is home to things you will never find anywhere else. Pristine beaches, historic ruins, the most mesmerizing scenery, the local flora and fauna and of course the 7,000-foot-deep coral walls that go down only 300 yards to the sea make this hotspot a must-visit. Visit Her Majesty Prison to dig into the 19th century when the prison housed the criminals after the slaves were granted freedom. The prison closed down in 1990s but now serves as a historical landmark. Feel like royalty for a day and check out the Governor's Beach. You will find shallow, the most stunning waters on earth, casuarina trees that provide shade and a powder-white sand beach that you won't be able to resist. This beach is located in the front of the British Governor's residence and when the cruise ships are not in port serves as an amazing secluded getaway for those that want to have the beach all to themselves. According to statistical estimations, the population of Turks and Caicos in 2016 was approximately 51,430. Ethnic groups consist of mostly black residents (around 87%), white residents (around 8%) and some of the other ethnicities such as mixed and East Indian. The natives of the island are called "Belongers" and are descendants from African slaves that were transported to Turks and Caicos to work in the salt industry or to grow cotton. Belongers are relaxed and extremely friendly individuals. They operate on the "island time" in a low key, very slow-paced tropical life enjoying the sun, the beaches and the palm trees. In case you require any kind of assistance, never hesitate to approach a local for further directions. They will be happy to provide help to tourists on Turks and Caicos vacation. Religion plays an important role in the life of the Belongers. The most predominant religion is Protestantism followed by Roman Catholicism and a small percentage of all other religious denominations. Since Turks and Caicos is a British Overseas Territory, English is considered the official language here. Spanish, French and Italian is spoken in the prairies of the island as well by immigrants from those countries. An English-based creole language, also recognized as Turks and Caicos Creole is also spoken among the locals. And even though it is a popular dialect on the islands, it is not taken as the official language. This type of creole is a mixture of English vocabulary and African grammar, and is very similar to other Caribbean creole languages especially Bahamian creole. Once your plane starts to descent, you will be amazed at the crystal clear, turquoise waters of Turks and Caicos. There are a few nonstop as well as connecting flights available from Atlanta, Dallas, Boston, Charlotte, Miami, Fort Lauderdale, New York, Newark and Philadelphia. Please check their schedules before booking your Turks and Caicos vacation, as they might vary depending on the season. Nonstop flights are also offered daily from Toronto and flights from Montreal depart on specific days of the week. European travellers departing from the United Kingdom must take a connecting flight either from one of the North American major cities or Antigua. You may also reach the mesmerizing Turks and Caicos by direct flights from other Caribbean destinations such as the Bahamas, Antigua, Montego Bay (Jamaica) and the Dominican Republic. There are two major international airports in Turks and Caicos located on Providenciales and Grand Turk. Providenciales International Airport in Provo has a full capacity to accept international flights of all sizes. JAGS McCartney International Airport in Grand Turk is located one mile south of Cockburn Town and occasionally accepts international aircrafts as well. North Caicos and Middle Caicos have smaller airports that used to serve domestic flights, but since there's no demand after the construction of a causeway and a ferry, they are not operating except for occasional smaller charter flights in North Caicos. Middle Caicos Airport is closed now. If you are planning on travelling to the less-explored North Caicos, Middle Caicos or South Caicos, you will land on Providenciales first for customs and after may continue your Turks and Caicos vacation to your final destination by ferry. Grand Turk is approximately 113 km (70 miles) away from Providenciales, and is accessible by local airplanes, cruise ships and yachts. If you are trying to reach Grand Turk, you would need to fly to Providenciales first and take a domestic flight to the Grand Turk from there. The flights are regular and only take about 30 minutes. Although Grand Turk's JAGS McCartney International Airport is called "international," usually the only large and international aircrafts that arrive here are charter planes, the rest are local domestic island-hopping flights. This can change during peak season, when many people want to go on Turks and Caicos vacation. Cruise ships dock in Grand Turk daily. Turks and Caicos is one of the most expensive Caribbean destinations, and although most hotels have high price tags, you will still find moderately priced options. There are a few all-inclusive resorts in Providenciales - Club Med Turkoise, Amanyara and Beaches Turks and Caicos Resort Villages and Spa, and a lot of other luxury hotels as well. There's a luxurious all-inclusive resort in Parrot Cay as well. You will find many options suitable for any budget, from family-friendly to adults-only, from villas to condos and inns, all of that and more is waiting to be enjoyed during your Turks and Caicos vacation. 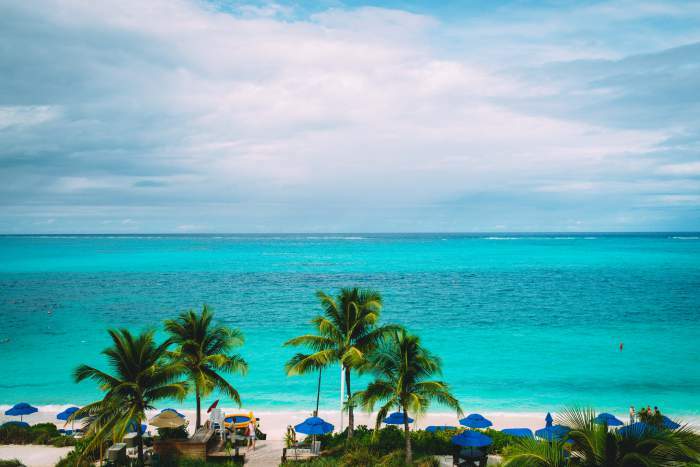 Aside from luxuriously beautiful resorts in Provo, there are resorts as well as small cozy inns on Grand Turk, Parrot Cay, North Caicos, Middle Caicos and South Caicos, that provide a very comfortable and enjoyable Turks and Caicos vacation. There are no exclusive amenities offered but you may find water sports activities such as diving or a choice of tours. Most of the resorts in Providenciales are upscale and many of them are condo-style with their own kitchen and dining areas to fix breakfasts and a few quick lunches. Villas and condos is what makes Turks and Caicos a famous destination for many. When the owners are not using their estates, they rent them out. These types of accommodations are plentiful on the island and serve as a great deal for families, large groups or extended stays. Both villas and condos get reserved in no time, so keep in mind that you need to book Turks and Caicos vacation villas at least a couple of months in advance. High season in Turks and Caicos runs from November to April and the weather reflects that. The weather during this time is quite hot but not so much humid as the constant trade winds keep it comfortably cool throughout. The general temperature during the high season is 27-29 degrees Celsius (80-84 degrees Fahrenheit). Water temperature during the winter months is super enjoyable at 23-26 degrees Celsius (74-78 degrees Fahrenheit). If you decide to go on Turks and Caicos vacation during the off season, you are in for a real treat. May to October is just perfect for enjoying the sun rays, the warm waters, the never-ending beaches and less crowded resorts and hotels. The temperature is around 29-32 degrees Celsius (84-89 degrees Fahrenheit), and even though it's super hot, the nice tropical trade winds help to cope with the heat. Drink plenty of water, wear sunscreen and enjoy your Turks and Caicos vacation. The summer season is also prone to experience some rainfall. Some areas might get as much as 40 inches of precipitation, while others, most visited by the tourist receive 20 inches of rain. Rain is not an every day occurrence, and when it does happen, it passes quickly. Hurricane season runs from June to November, but chances of a real hurricane are very slim. Although there is a lot of rainfall during this time, it mostly occurs either at night or in quick warm showers during the daytime. Even though Turks and Caicos are relatively small islands, getting around might be both expensive and difficult as there is no organized public transportation there. The only way to move around the islands is to either rent a vehicle, use taxi service, cycle or simply walk. Some all-inclusive resorts and hotels might offer complimentary transport for their guests to use, but that service will depend on the hotel and the package you are purchasing from them. Taxis are widely available at the airport in Providenciales, and sometimes they stroll through the streets looking for customers to pick up. If you do not see a taxi, you will need to call one. Most taxis are metered and the government sets the rates depending on the distance. Although the price is always the same, confirm it before getting into the vehicle. Fees might change if you have a large group of people, so make sure to discuss that with your taxi driver before you begin your trip. Some tourist love exploring Turks and Caicos on a bike, but that form of travelling is not recommended as there are a lot of reckless drivers, the lack of cycle lanes and the intense heat and sun. Car rental is an absolute must when you are planning to dedicate a day or two то exploring the islandс. Driving in Turks and Caicos is on the left side, British style and in order to secure a good spot, reserve the car well in advance to avoid long lineс during the peak season. Many agencies pick up and drop off their clients at the airport, villas and resorts. 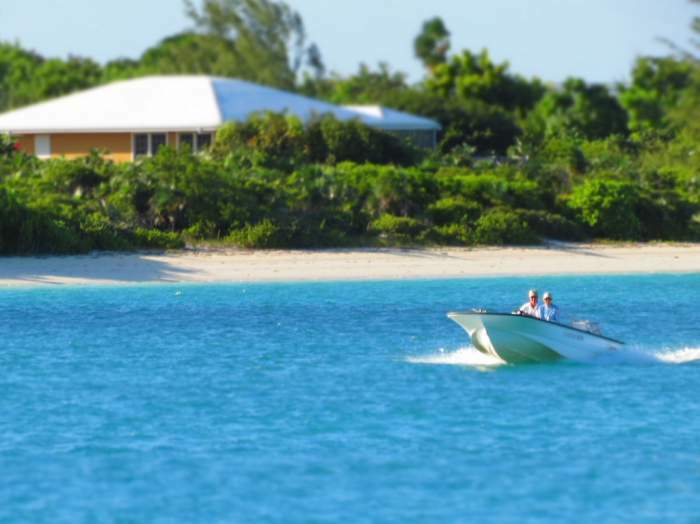 For such a convenient service inquire about it at the time of booking your Turks and Caicos vacation. Tourists that choose to rent a car must be prepared to present a valid driver's licence from their home country as well as obtain insurance for the period of operating the vehicle which can be requested at the agency. You will require an International Driver's Permit if you driver's licence is in the language other than English. For the most adventurous visitors scooters, bikes, ATVs, buggies, SUVs and jeeps are also available for rent. Tour the island at your own pace in the comfort of the vehicle of your choice. There are no stoplights in the country, so the traffic is regulated by roundabouts. They are a new thing in Turks and Caicos and many drivers are still getting adjusted to them. Keep that in mind and drive slowly once you approach a roundabout, give the right of way to the car on your right and also look in both directions for safety. The speed limit in towns and populated areas is 32 km/h (20 mph), and outside of towns is 64 km/h (40 mph). Fuelling the car might get expensive as the gas prices on the islands take a hike every now and then. But since the islands are quite small, gas will not cost you a significant amount of money. Just have cash handy, as a lot of gas stations accept that type of payment only. Parking is available throughout, anywhere you can find a free spot. It is normally free of charge if you are able to find space to park. The official currency in Turks and Caicos is the United States dollar. On Providenciales and Grand Turk, all bank branches have ATM machines, so withdrawing cash from your debit/credit cards is simple. However, once you get to the more remote islands, you will definitely need to have cash handy as not many places there accept credit cards or any other form of payment except bills and coins. Except on the smaller islands, almost all of the establishments accept credit cards and some even welcome traveller's cheques that can be cashed in at locals banks. Some banks will give out cash advances on credit cards, inquire about such service at the bank you will be using during your Turks and Caicos vacation. Tipping rules in Turks and Caicos are almost the same as in the United States. If you are going on Turks and Caicos vacation in a resort or a hotel, then expect to see a 10% service charge added to your invoice when you leave. This charge includes gratuity for all hotel staff. However, for over the top service, patrons are more than welcome to leave extra tips at the end of their stay. If the 10% charge is not added to the bill, inquire about that specific resort's tip rules with the management. A lot of restaurants, cafes and other establishments automatically charge 10%-15% on top of their final bills, but some leave it up to the customer to take care of. If the service charge is not added, tip anywhere between 10%-15%. All restaurants and hotels charge an additional 12% government tax, that is mandatory to pay by all guests. Keep in mind it is not the service charge and it goes directly to the government. There are no income and property taxes in Turks and Caicos, so the 12% fee is what funds the administration of the island. If you are renting out a villa, your housekeeping staff might change throughout your stay, so it is better to leave tips for them every day. Depending on the size of the villa and the number of people staying, the average tips are $25 per day. If you are staying in a resort or a hotel, then a $5 per day gratuity charge will be very much appreciated. For those renting a bedroom, the housekeeping fees are slightly different. They are anywhere from $10-$15 per day depending what kind of room you are renting, how many people are staying and the amenities that are included. If the housekeeping service arrives twice per week only, leave $50 for them. If you are renting cabanas and/or chairs at the pool, normally a tip of $6-$10 per day is considered generous. Hotel porters receive anywhere from $2-$3 per each suitcase that they help you carry and deliver, while taxi drivers get 10% of gratuity from the total fare. If they provide tour guide services, acknowledge them for their time by tipping anywhere between 15%-20% of the total fare price. Those employees that provide services in excursions, tours, trips and water sport activities, would appreciate small tips for their efforts as well. Tip at your discretion only depending on the level of service you have received. You may rest assured that during your Turks and Caicos vacation it is almost impossible to be approached by beach vendors. You may come across one or two people offering water sports or tours, but they will only come up to you if you wave them down. Street vendors are in abundance in Turks and Caicos, but just like those rare beach merchants they are never bothersome. If you like any of the goods offered in their huts, simply approach them for further details about pricing, quality etc. If you have no interest in purchasing souvenirs, gifts or other memorable items, just walk by. Turks and Caicos are among the safest islands in the Caribbean. However, one should always take general safety precautions, especially if you are vacationing here. Avoid wondering off alone at night or in the dark, travel with a group of friends or together with another tourist who is travelling in the same direction as you. Remote and isolated areas in any country increase a chance of being a victim of crime, so avoid such areas and spend your Turks and Caicos vacation in safe regions. Turks and Caicos is considered as one of the most extravagant islands, with upscale resorts, top notch service and the price tags that reflect the luxurious vacations the islands offer, but it doesn't mean you do not need to be vigilant and cautious during Turks and Caicos vacation. Leave all of your personal belongings in a hotel or villa safe, and try not to be flashy in public. All of your expensive personal property should be left at home in order not to cause unnecessary attention. Although car theft is a quite seldom here, take all of your property with you, when leaving your vehicle, roll up the car windows and lock the doors. These are general safety rules that need to be followed anywhere you choose to travel to ensure a safe and enjoyable Turks and Caicos vacation! Tap water in Turks and Caicos is absolutely safe to drink. If you have a sensitive stomach or your body is not immune to changes in water and food, then opt out for bottled water that is available across the islands in local stores, supermarkets, restaurants and cafes at very reasonable prices. You might find that in some parts of Turks and Caicos, the tap water has a distinctive taste. In that case, just refer to bottled or boiled water. Electrical sockets in Turks and Caicos supply electricity of 110 to 120 volts (60 cycles), just like in North America. Tourists from the US and Canada do not need adapters during Turks and Caicos vacation. Guests from Europe will need to keep in mind to pack a plug adaptor and a transformer/converter, as their appliances are able to handle voltages of 220-240 volts, and will not work on the islands if used without the appropriate accompanying plugs. Copyright © Beach Vacations And More 2016-2018 By Svetlana Rubejov. All rights reserved.